These are lovely news - Cart2Cart turns 9 in June 2018! Do you like birthdays? We hope you do and will eagerly share a couple of lines in this post celebrating the marvelous moment with Cart2Cart Team. Since day one, Cart2Cart has evolved into the most trusted service for migrating online stores worldwide. Data import is supported to/from 80 (!) shopping carts, and we’re constantly working on adding new solutions to this list. We Wouldn’t Make it Without You! Ask anyone at Cart2Cart what is the key to our success - and we’ll tell you without hesitations - our customers make our job meaningful. We’re incredibly thankful for each and every one of you. Cart2Cart reviews (and we’ve received hundreds of them) inspire us and makу every day at work count for all of us. We love what we do and hope you feel this kind of attitude! Since the time we performed the first data import our Tech Team has worked hard to become an expert on automated migration. Now we know even the slightest peculiarity of the solution you migrate to/from and will always let you know what aspect to keep in mind. You can always reach out to our 24/7 Support Team and get the most comprehensive analysis of your particular case. We’re more than happy that the phrase - shopping cart migration is associated directly with our service. The fact we’re most proud of is that Cart2Cart is official migration partner for the most reliable and popular eCommerce solutions. Our competence was acknowledged by Shopify, WooCommerce, PrestaShop, OpenCart, and others. There are many more migration partners we’re happy to cooperate with and hope our collaboration will be as beneficial as it has been all these years. Cart2Cart was started with one goal in mind - to make the process of data export effortless. Today our clients go through the simple 3-step procedure and can get all the entities transferred in a couple of clicks. Back in 2009 performing 1,000 migration was a glimmer in our mind’s eye. In October 2017 we completed the 100,000th migration and are now looking forward to the 200,000th. Where is our Cristal Ball? There are many achievements, both big and small we’re proud of, yet the biggest ones are ahead. We don’t have a magic ball to tell us our future, yet we’re sure Cart2Cart values will propel the company in the right direction. 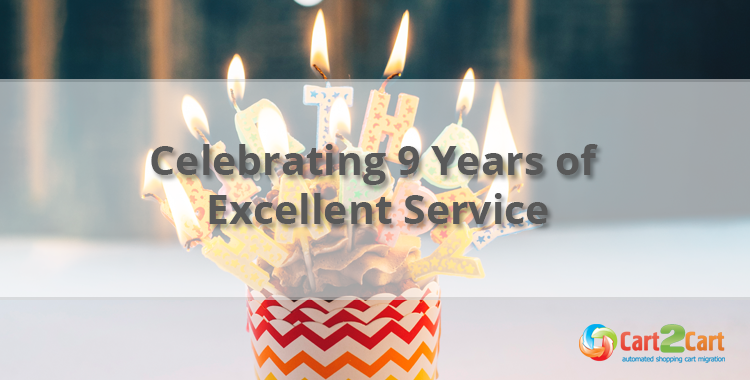 Once again, we send warm and sincere thank you to our loyal customers, partners, and every member of our strong team. Looking forward to the big 10th anniversary next year! Happy Birthday, dear Cart2Cart! Thanksgiving Special - Get a FREE Re-Migration! It’s Thanksgiving! Accept Cart2Cart's humble thanks and benefit from our special offer -- 1 re-migration absolutely for FREE! Till November 27 only, you can easily perform a free, full-scale re-migration in a click within 7 days after finishing the initial shopping cart migration.What’s the benefit? Throughout the year, Migration Insurance service (for 1 re-migration within 7 days) adds up 9% to the migration cost. However, it’s now completely free to ANY user who picked this additional service plan and launched Full Data Transfer from November 21 to November 27. As the result, you have a chance to save money and safeguard yourself from additional spendings if re-migration’s needed (which would usually cost you 50% of the initial migration price). Everything is setup for your convenience already. 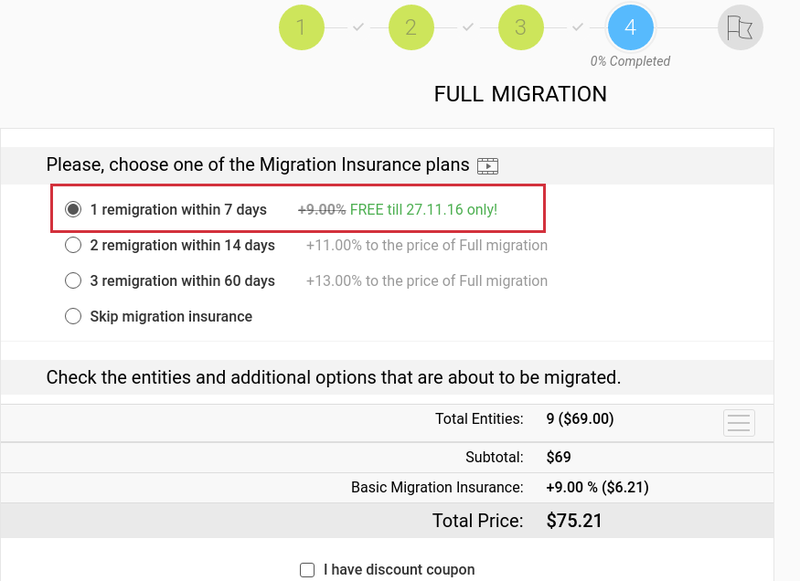 After performing Demo Migration , just ensure that 7 day Migration Insurance is chosen as demonstrated on the screenshot below. If needed, however, you may choose other Insurance plans (pay attention they are not discounted). Why may I need re-migrating? Re-migration (Insurance) service is what safeguards you from additional expenses in case of unexpected circumstances. So, enjoy your Thanksgiving celebrations and spend some quality time with your family! And, of course, hurry up with the migration -- FREE re-migration insurance can be chosen till the 27th of November only! Fearing to sound repetitive and boring we’ll still say it once more - Cart2Cart expands your migration possibilities again! Though it’s dogs who are famous for eagerly and, at times, pathetically, expressing affection, Cart2Cart is about to surpass. Here is our new gift to you, a blatant plea for your love - automatic migrations to Shopware shopping cart. Do you remember the unisex futuristic jackets in “Back to The Future 3”, with the adjustable size? Well, Shopware's just like them - suitable for everybody. No matter what your current technical level is and which kind of store you want to run - a small, niche shop or a huge retailer - Shopware will meet your needs in each case. The platform’s flexible, easy to install and use and provides unique marketing and SEO functionality. It’s straightforward back-end will satisfy new shop owners, experienced merchants, designers, developers decision makers, in a word - everyone. 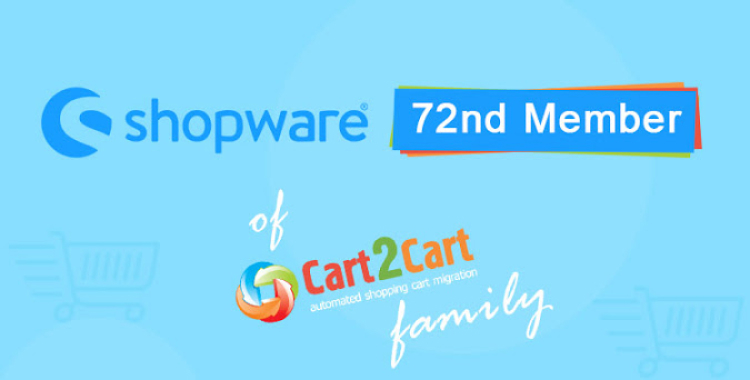 Using Cart2Cart, you’ll be able to transfer all the vital entities to Shopware, like products, customers, orders and additional store data. The cost of such transfer, as usually, starts at $69 and depends solely on the number entities you’d like to move. Thus, If you want to equip your store with the uplisted progressive features at once - migrate to Shopware right now, starting with free Demo Migration. 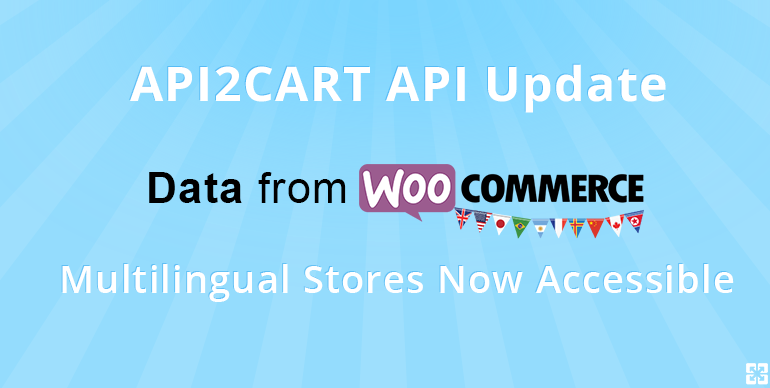 We are excited to share that your applications can now use multilingual product data from WooCommerce stores via API2Cart! Our API now supports data import and export for WPML, a plugin that over 400000 WooCommerce merchants use to make their websites multilingual. For more details about WPML and practical tips on how to work with it through API2Cart, read a related docs section. Have questions about how you can use this to the benefit of your business? Let us know by leaving a message! We will answer shortly. In the meanwhile, try how our API works yourself (you can add your test store or use a demo store of ours). 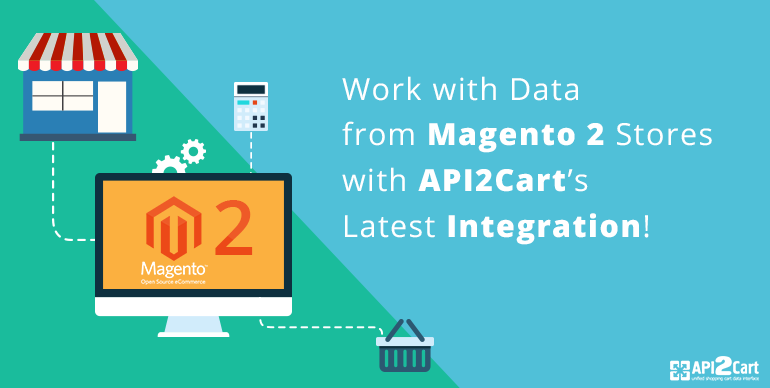 Work with Data from Magento 2 Stores with API2Cart’s Latest Integration! Both old and new, our customers like and request enhancements and integrations, so API2Cart is delighted to announce a newly developed connection with Magento 2. What does this integration entail? With API2Cart, you can expand to a new segment of Magento users. Just like our other integrations, one with Magento 2 lets your application retrieve and work with virtually any data from stores run on the platform. You can weave it into your service chain to make the eCommerce experience of your Magento-based users better. Once they upgrade to the new version, you will have everything to keep the service uninterruptedly going for them. Plus, the integration means your service will work for existing Magento 2 users.